After 12 hours of tennis spread over 6 days, plus a mini tournament at the end. What did the girls think? 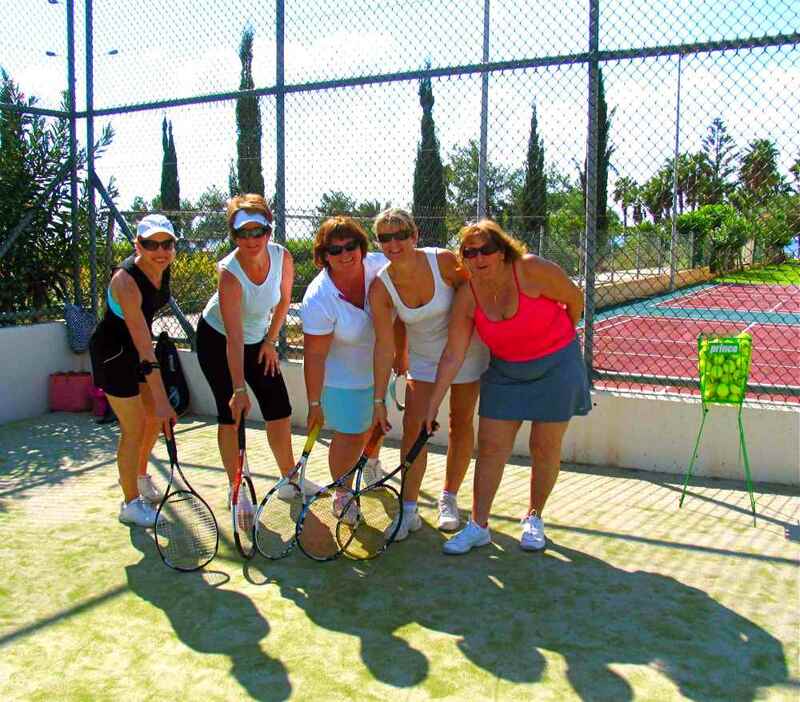 Sue, Prue, Ruth, Sheena and Steph had taken a leap of faith booking an intensive tennis week with an unknown (to them) tennis coach, Sacha Appleton. They’d previously been on a number of tennis holidays in Spain (La Manga), Portugal and elsewhere, so you could say they were experts on tennis courses. The first day was just an introduction, with some basic tennis skills and some matchplay. then each day, a different area was covered, with some revision of the previous days. the final day ended in a mini-tournament won by Ruth – well done! Everyone played well and I’d like to think everyone had improved. I’d certainly like to think that Sheena’s serve in particular had become more of a weapon. But what did they think? After the mini-tournament, we all gathered for a very healthy post match drink (well there was fruit in them) and reviewed the course. According to Ruth, she enjoyed taking a look at different aspects, like learning better how to focus and learning a bit more about strategy. She felt it wasn’t something that had been covered in their previous 8 tennis holidays. Pru felt that several simple tips on technique had helped her and would be easy to remember when she got back. Sue just enjoyed learning together and felt her service had improved. Even just looking up and aiming the serve. Loosening the grip and learning where to hit the ball were also tips that they liked generally. As a whole, they liked that the programme was individualised, tailored to them. With all their previous courses, there was always a set area to cover each day and often the coaches tried to push them to do techniques, such as a topspin serve, that they weren’t comfortable with. This was the first time they were coached by a woman, which they found less intimidating and they had fun. Overall, they believed their game had improved and that they had been given the tools to be able to continue with this improvement, spot any errors creeping in and correct them. This entry was posted in Cyprus Tennis Coaching and tagged Cyprus, Cyprus Tennis, Cyprus Tennis Academy, La Manga, Tennis, Tennis Clubs in Cyprus, Tennis Clubs in Paphos, Tennis Coaching in Cyprus, Tennis Coaching in Pafos, Tennis in Cyprus, Tennis Lessons in Cyprus, Tennis Lessons Pafos, Tennis Tournaments in Cyprus by Paphos Tennis Coach. Bookmark the permalink.